NEW YORK (JTA) – It wasn’t the yarmulke-wearing, Shabbat-observing Tamir Goodman – once dubbed the “Jewish Jordan” by Sports Illustrated – at a Jewish community center news conference telling the world he was heading to the NBA. 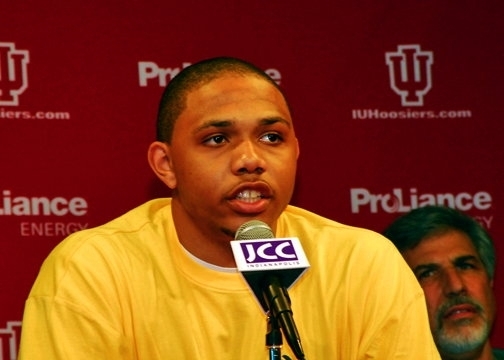 Rather it was Eric Gordon – a 6-4, black, non-Jewish shooting guard from Indiana University – who sat before 300 friends, family members and the national sports media on Monday at the Arthur M. Glick JCC in Indianapolis to say he was going pro. Odd as it may seem, making the announcement at the JCC was a natural for Gordon, who is expected to be a top 10 pick in the NBA draft after becoming the first freshman to lead the Big Ten conference in scoring at 20.9 points per game. After all, before he was named Indiana’s Mr. Basketball as a senior at North Central High School, before he earned third team All-America honors from The Associated Press at Indiana, he started his basketball journey at the JCC. A non-Jew belonging to the JCC in Indiana is not unusual. Only about 3,500 Jewish families live in Indianapolis, and about half of the JCC’s 3,000 members are non-Jews – a pretty typical situation for a Midwestern JCC, Jaffee said. He noted that from an early age Gordon, whose driveway is “literally a three-pointer away from the driveway of the JCC,” was an unusual basketball player. Gordon played in JCC leagues for five or six years before graduating to the world of AAU basketball and travel teams as a young teenager. But he still works out there during the off-season and occasionally plays pickup games. Last year the JCC honored the Gordon family at its executive meeting. Gordon’s decision to make his announcement at the JCC seemed to return the favor, Jaffee said.